Big, beefy fruits that weigh over 1 lb. each are packed with rich, tangy tomato flavor. 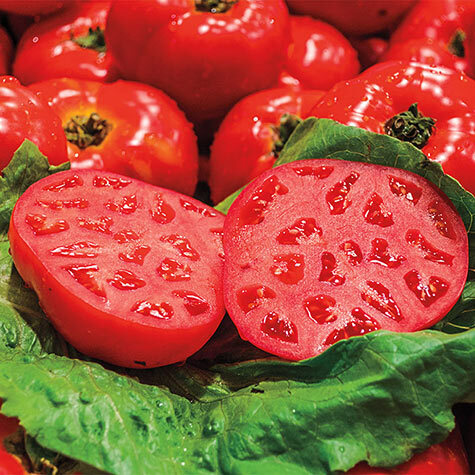 Intensely red, meaty flesh is wonderful on sandwiches, in sauces and salsas, and is perfect for canning and freezing. Vigorous plants are disease resistant and produce heavy yields. Determinate. Disease resistance: VFF. 80 DAYS. Botanical Name: Lycopersicon lycopersicum "Ruby Monster"
Depth: When transplanting, set the plant deep, up to the first true leaves, by digging a deep hole or digging a trench and laying the plant on it's side in the trench. The stem will develop roots along it's length. Fruit: Enormous beefy red tomatoes, with the traditional beefsteak appearance- 1 lb. + fruit. 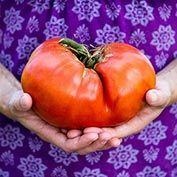 Comments: Giant size & the perfect old-fashioned tomato flavor are the selling points of this big beauty. 1 lb. 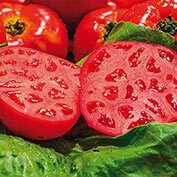 + fruit are intense red through & through, with meaty texture and rich tangy sweet tomato flavor. Hybrid plants are vigorous & disease resistant, with heavy yields.